The product comes in a rectangular, matte metallic gold colored box. One side of the box is sealed with a hologram Mizon's "Genuine Seal of Authenticity" sticker with "Mizon's logo" and the words ".Original Mizon." and "MIZON(in both English and Korean)". 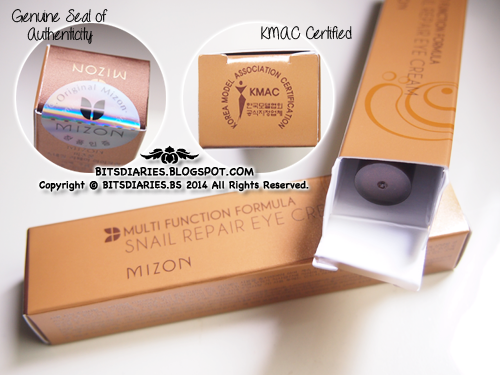 There is a "Korea Model Association Certification (KMAC)" logo printed on the other side of the box. TIPS: Look out for the "hologram seal sticker" when you purchase any Mizon products. As long as there is such hologram Mizon's seal sticker on the package then no worries, you pretty much got the real stuff. 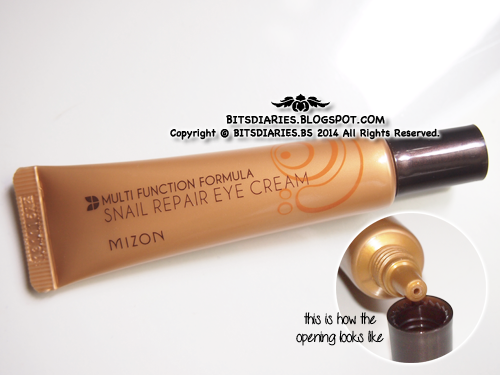 It comes in a squeezable metallic gold colored tube with a bronzy-brown plastic screw-off cap. It has a white, soft, tacky and creamy consistency. It's light and thin thus, it gets absorbed pretty fast. 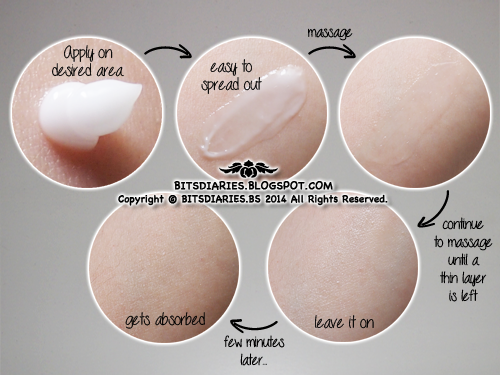 It may feel sticky at first but once it gets absorbed, the stickiness will be greatly reduced. It's not very greasy and it leaves skin matte and hydrated. It does not contain any artificial fragrances but it does have a mild scent which I don't know how to describe. 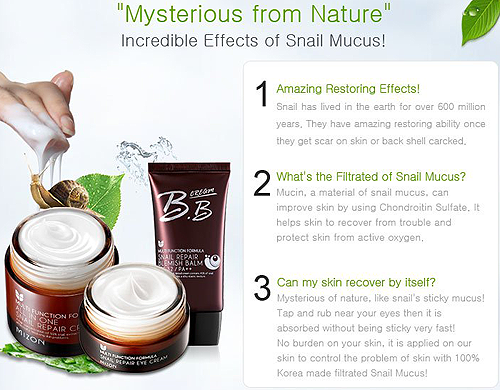 It has a similar scent to Mizon All-In-One Snail Repair Cream. The scent is not too strong hence, upon application, it's barely noticeable. 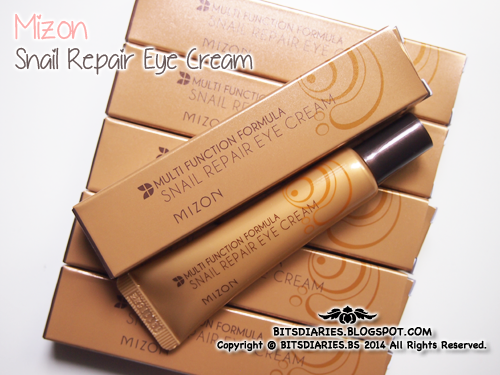 Verdict: Mizon Multi Function Formula Snail Eye Cream hydrates the delicate skin around the eye area without leaving a thick layer of stickiness or grease once it gets absorbed. It is not very heavy hence, it gets absorbed into the skin kinda quick. Regarding to the claims on fine lines and wrinkles... well, I only have one mild fine line on each under eye area. After using this eye cream for about 3 to 4 months, the fine lines are gone and I feel the skin around the eye area is firmer. FYI, my mom also uses this eye cream. It is part of her skin care routine for more than a year! Up to present, the appearance of her wrinkles and fine lines around her eye have also reduced and the eye area feels more firmer too. We can totally feel and tell the difference! Take note that with long-term use, the results are more noticeable. On the downside, this eye cream does not seem to diminish my dark circles. However, it does brighten up the eye area and create an illusion that make the dark circles less dark. The brightening result is subtle though. With that said, this might not be able to help much in treating and/or concealing extreme dark circles. 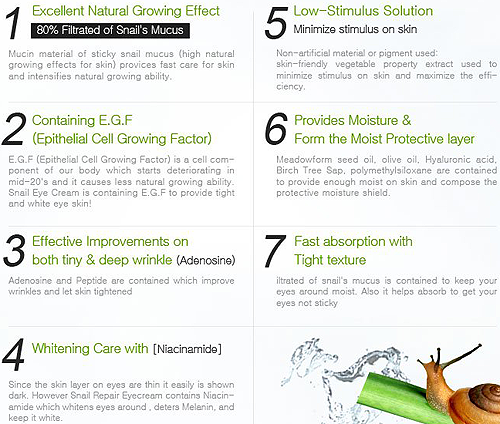 In my view, this eye cream care more on fine lines and wrinkles. 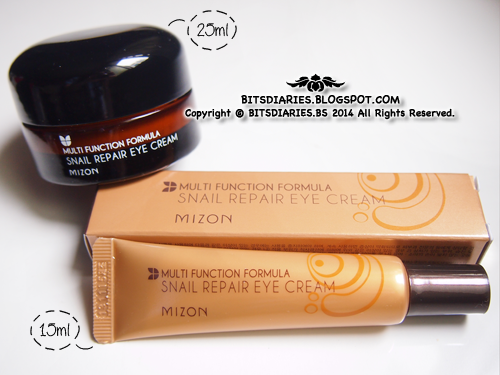 Mizon Multi Function Formula Snail Eye Cream comes in jar and tube. Jar contains 25ml of product whilst tube contains only 15ml of product. I got it in tube because I find it is smaller, more compact and lightweight, which makes it more travel-friendly. Besides that, it is more hygienic and convenient to use in my opinion. I just need to gently squeeze the tube to get the product out and it's easier to control the right amount I need. As for the jar, in terms of hygiene, I need to use a spatula (included in the box) which I find it is harder to get the exact amount. I always dig out either too much or too less... Therefore, I think tube is more user-friendly, travel-friendly, hygienic and hassle-free than the jar one. It is time-saving as well, as I do not need to clean the spatula after each use. Despite it's a small tube but a little goes along way! Nice review! Just about time as I was wondering about this product when you posted about the giveaway. Me too, would prefer the tube ones.